"Turned out pretty good right? Thanks for coming out @dailyblastlive!" "When my wife and I are out with the kids, New Saigon is one of our go-to restaurant options, and we always order the Dungeness crab legs. In fact, we always order two platters of crab legs because my kids can finish one on their own. Stir-fried with butter, garlic, onions, and black pepper, they’re easily some of the best crab legs I’ve ever had." "Sushi Den has some of the best fish I’ve ever had, and I love their Dynamite. 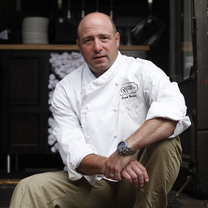 It’s inspired many incarnations in my own restaurants." "The chile relleno has the perfect level of spice, and it’s a screamin’ deal. The flavors are out of this world." "When Sassafras American Eatery opened in June 2012, my family was excited to try it. I love a good Southern breakfast, and Sassafras nails it when it comes to comfort food. The restaurant is charming and comfortable, and the biscuits and gravies dish has become something I crave after a long week on the line. The biscuits are perfect: soft, crumbly, and buttery. There are three gravy options (sausage, mushroom, and duck confit), and I like them all. Don’t miss the housemade condiments." "As soon as I tried the French dip at Cherry Creek Grill, I was hooked. It’s one of the best sandwiches I’ve ever had, and I know I’m not the only one who feels this way. The meat is sliced paper-thin, the bread is toasted perfectly, and the au jus is well-balanced." "The Sicilian out of the oven @luca_denver"
"Tomorrow this will be mint chocolate Oreo soft serve at Bones"
"Omar's crab spring roll @bones_denver"
"Dough nut Fioie Gras & Almond mousse strawberry rhubarb jam Almond glaze @mizuna_denver"
"Focaccia proofing for @diomiopasta at salt & grinder tonight."